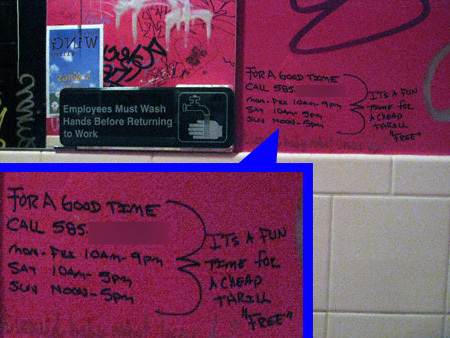 It is quite a rare occurence when I see something in a public restroom that compels me to run back and get my camera. And this is exactly what happened yesterday when I was dining at San Loco— much to my companions’ amusement and confusion. The general perception is that Williamsburgers (and by implication, hipsters) are lazy. Nothing can be so far from the truth. As you can see this person is quite dedicated to dispensing free “cheap thrills”.